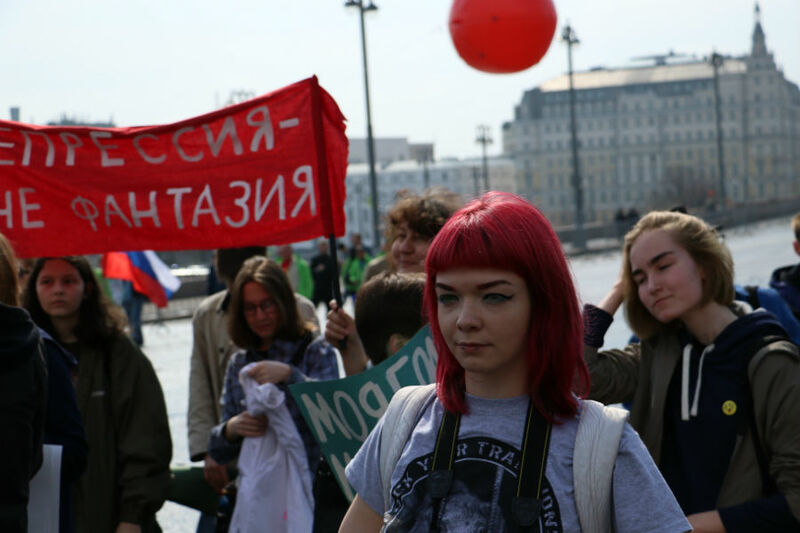 At this year’s May Day demo in Moscow, almost three dozen people marched with placards inscribed with slogans on the harm caused by stigmatizing mental illnesses. Police detained the marchers at the head of the Bolshomoskvoretsky Bridge and took them to police stations. Only a few marchers in the group managed to avoid being detained. Takie Dela found out what the psychoactivists wanted to say by marching. This year, a group of psychoactivists—artists and human rights defenders, researching mental illnesses, mental quirks, and the boundaries between normal and abnormal—brought up the rear of the traditional procession organized by the Federation of Independent Trade Unions (FNPR). The marches carried placards inscribed slogans like “Antidepressants are a girl’s best friend,” “We’re coming out of the psycho-closet and expect acceptance, not a 100 years of solitude,” “I know my own diagnosis. Do you know yours?” “The affective class,” and “Stop romanticizing and depreciating us.” Ekaterina Nenasheva, an organizer of the Psychoactive Movement, leafleted passersby with flyers detailing how to behave if your loved one suffes from depression, anxiety or panic. The group had managed to cross the Bolshoi Moskvoretsky Bridge, from the police checkpoint and the metal detectors to Basil’s Descent, when the activists were detained by regular police and riot police (OMON). As witnesses testified, the police roughed up the activists and ripped their placarads. The law enforcers could not settle on a reason for apprehending the activists. Some of them were told it was because of what written on the placards, while others were told it was because the march had not been authorized. The detainees were split up, loaded into paddy wagons, and taken to the Basmanny and Tagansky police stations. 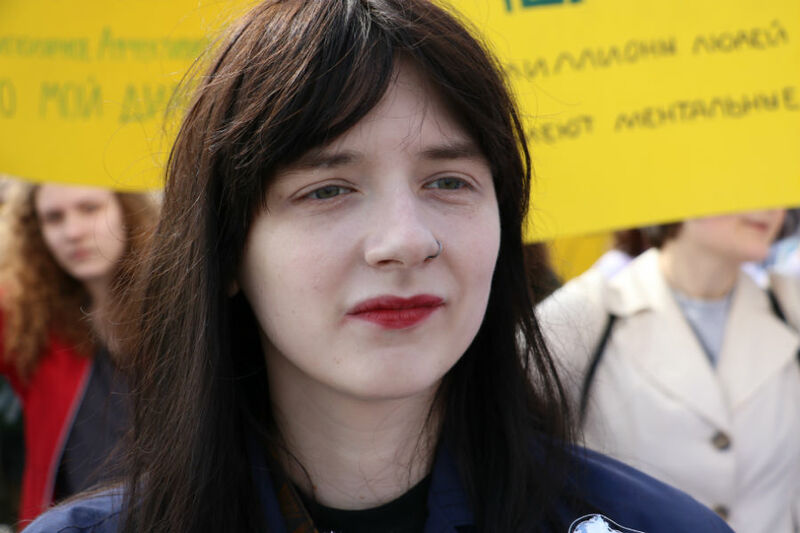 In the paddy wagons, policemen told the activists they should have vetted their placards with the rally’s organizer, the head of the Moscow Federation of Trade Unions. However, the rally’s website indicated all comers had been welcome to join the demonstration. “We were asked to write statements and undergo preventive discussions. Each of us was assigned our own personal police officer, who said he was informing us that, by law, it was wrong to be involved in unauthorized rallies,” said Mikhail Levin. The activists were released several hours later without having been charged with any offenses or fined. The detainees noted they had also been questioned by Center “E” (Extremism Prevention Center) officers, who photographed their placards. It is believed that people with mental disorders can only be consumers of someone’s kindness, charity, tolerance, and pity. But they are completely capable of speaking out for themselves and being a social, political, and cultural force. It’s a slightly exhibitionist move to proclaim you have an illness. The guys and gals marched with very personal placards about their own quirks. We also want to demand reforms in psychiatric treatment and talk about the need for deinstitutionalizaton and our disagreement with plans to ban the import of certain medicines. Marching with trade unions, with other workers, was an important statement. We wanted to say we also produce meaning, ideas, and work. This was the first attempt to do something like this, so it is fine that we are not a united fist, that we have different demands and opinions. What we wanted was just this: to bring together people with different mental makeups and show off this polyphony. I have paranoid schizophrenia. I have been hospitalized five time; three of those were involuntary. In the psychiatric field, I’m involved on an institutional level as a simultaneous interpreter and translator. 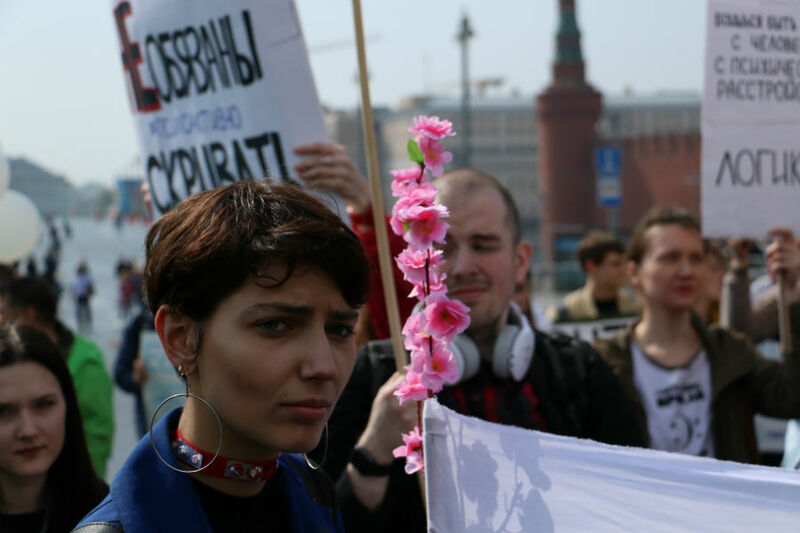 Our May Day bloc was conceived as the Russian version of Mad Pride. On the whole, however, we are more inclusive than Mad Pride, because in recent years they have shifted very hard towards antipsychiatry, and that is not for everyone. Yes, there is the system, and it is really poor organized. It contains neuropsychiatric residential care facilities and neuropsychiatric dispensaries in which nothing goes to plan and the rules are not followed, but this does not discredit the idea of psychiatry, the presence of illnesses, and the possiblity of treating them. If we have taken the step of vetting our bloc, the demo’s organizers would have found excuses for not letting us march. I’m totally convinced that the cops saw a bloc of young people, some of them had tattoos, and they were carrying placards with slogans too boot. In their minds, there was a clear like with youth rebellions, and their immediate reaction was to remove us right away. Since childhood, I have had a few mental illnesses (OCD, agoraphobia accompanied by panic attacks, and anxiodepressive disorder) and so for a long time there was nowhere I could go and no one to go with me, because people’s awareness of mental health in Russia is somewhere around nil. So, I write and talk a lot about the visibility of people with similar quicks. I’m not afraid to say I have mental illnesses. I want the people in my life to pay attention to their own states of mind and offer help to people having trouble. I want the hate speech to disappear from the Russian language. People who do dumb or bad things should be not called psychos and schizos, and they do not need psychiatric treatment. All of these things have nothing to do with each other. Fortunately, things have been getting better lately, thanks to psychoactivists, journalists, and blogger doing outreach work on the rights of people with mental quirks and bringing the topic of psychiatry out of the gray zone. What happened on May 1 was unprecedented, of course. It was the first Mad Pride in Russia, and it did not end the way everyone expected. We had come out to tell people that we people with mental illnesses existed. The people in our midst, the other marchers in the May Day demo, smiled at us, applauded us, and took our pictures. After reading our placards, several people decided to join our bloc. But then, twenty minutes or so later, a mob of riot police (OMON) and Russian National Guardsmen came running at us. They ripped our posters and our banner, confiscated all our placards, and dragged people away. Some people they practically dragged over the pavement, while they took other people by the arm. Many peole had severe panic attacks, including me. Fortunately, I always have my pills along. Otherwise, I simply would have passed out right there on the spot. That is how I react to unexpected, stressful circumstances. My panic attack continued in the paddy wagon, but it was no longer so intense because I had taken a tranquillizer. But I suffer badly from claustrophobia, so I asked to be released from the cage, which opens from the outside. Fortunately, the riot police immediately agreed. I think it had something to do with the fact that there have been precedents at the European Court of Human Rights, cases in which transporting claustrophobics in so-called cages and glasses has been deemed torture. While we drove to the Basmanny police station, the law enforcers were keen to ask me why I was so nervous, what Psychoactive was about, who had diagnosed me, and why we had marched. “It’s the same feeling, only imagine you haven’t run five kilometers, that these feelings come on for no reason at all,” I snapped back. Mental quirks and mental disorders are a topic means a lot to me, something I tried to live with for a long time without paying attention to it. Ultimately, however, I realized that living a full-fledged life meant accepting myself the way I was. I realized that if I wanted to changed the world I had to get a move on, to be around people who shared my values and views, to be part of a community. The arrests were particularly hilarious when you could hear the announcers in the background talking about peace, labor, unity, and May, while the police were detaining a group that was just gaining the strength to assert itself, because this was an incredible effort for them. I know what a person who suffers from sociopathic disorders feels like in a crowd. Going on a demo is a huge effort, a big step towards a partial recovery. The psychoactivist community emerged in January 2018. Their projects have included Psychoactive, which focused on communication and creativity, and I’m Burnt Out, which dealt with emotional burnout. They also have their own brand of clothing and accessories.